One in every three bites of food relies on pollinators like honeybees. Hedgerows—native shrubs and trees—can bolster wild bee populations. But are they enough? Take a drive down the rural highways slicing through Fresno and Madera counties in central California, and you’ll see thousands of acres of perfect, seemingly endless rows of almond trees lining the countryside. If it’s early March, chances are that every tree is in bloom, branches dusted in pink and white flowers like soldiers covered in snow. California is the leading producer of almonds in the United States. 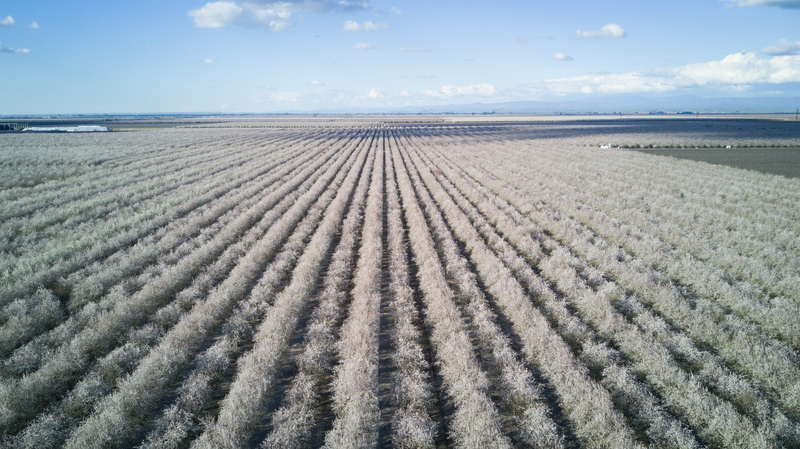 The USDA says that in 2015, there were an incredible 1.11 million acres of almond orchards in the state, up 6 percent from the previous year. Five counties—including Fresno and Madera—are responsible for growing 73 percent of the state’s almonds, making central California vital for the hundreds of natural product brands transforming almonds into nondairy milk, healthy nut butters and nourishing, plant-based snacks. The few weeks when almond trees are in bloom is an essential time for almond growers because it’s when pollination occurs—a process dependent on commercial beehives. While there are upwards of 1,500 native bee species in California, in central California, where almond farming reigns, wild bee populations are nearly extinct. A main reason: Other than the few weeks in early March when the almonds are blooming, there isn’t enough food year-round for bees to survive. So farmers truck in millions of honeybees from across the country—sometimes bees travel thousands of miles—in order to pollinate the orchard. To better understand what this pollination process looks like, I traveled with Häagen-Dazs to the 9,000-acre Harris Farms based in Chowchilla, California, at the peak of pollinating season. 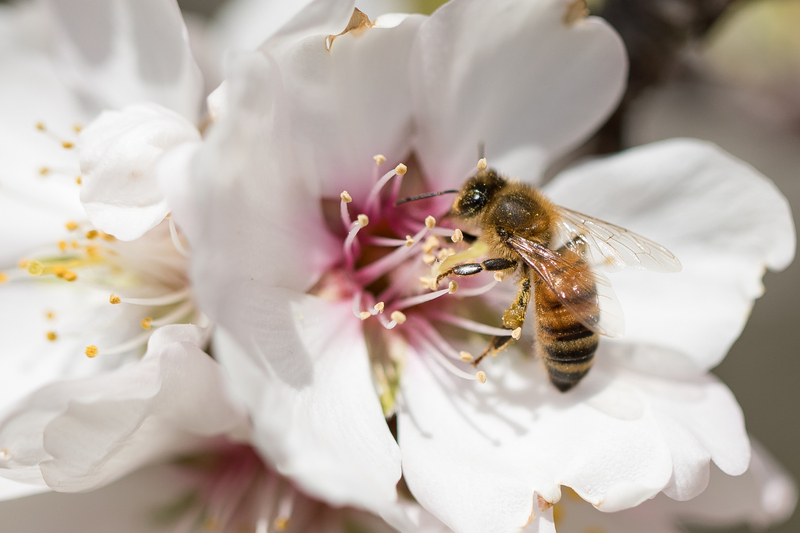 Recognizing that many of its ingredients—including almonds—would not exist were it not for honeybees, Häagen-Dazs has donated $1 million to honeybee research since 2008. More recently, the ice cream company teamed up with the Xerces Society to shore up native honeybee populations through the creation of hedgerows, strategic planting of native flowering plants on the farm. Here are the benefits—and limitations—of this tactic. While I'm a huge fan of eating almonds, I had never seen an almond orchard before my trip to Chowchilla, let alone a flowering one. It was beautiful. But it’s clear that like most modern agriculture, almond farming relies on a monocrop method. No other plants—especially not flowering plants that could be suitable food for bees—were visible in the orchard. This lack of biodiversity in agriculture is one reason why wild bee populations have dwindled over the past decade. While managed, commercial honeybees feast on almond nectar, flying from blossom to blossom and transferring pollen from one tree to the next, when the blooming period ends, it’s a famine. The managed hives are trucked back home or to a different crop, and wild bees die off. 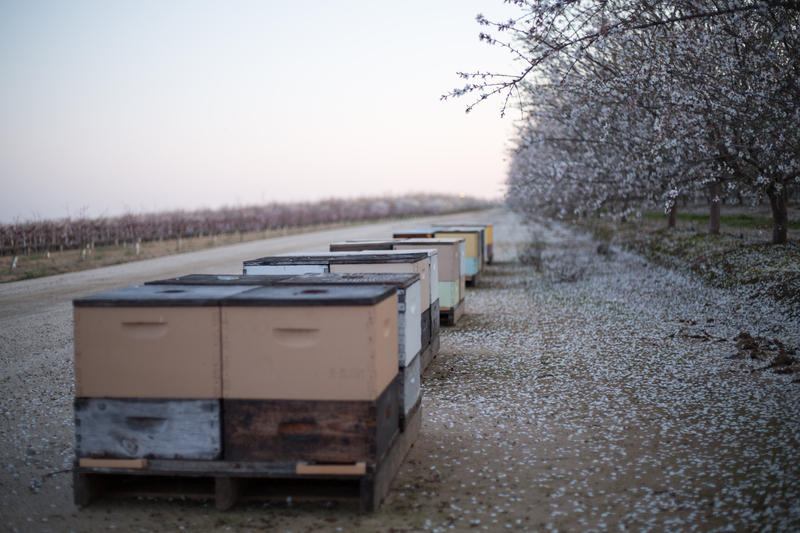 Experts like Eric Lee-Mader, co-director of the Xerces Society’s Pollinator Program, estimate that approximately 1.5 million honeybees—around 90 percent of commercially managed honeybees in the United States—come to California’s central valley during the almond bloom. "Bees have come from Maine, from Florida, from Texas, from the Dakotas, from all over the country to pollinate this crop," he said. When I visited, multi-colored hives lined the perimeter of the orchard, and bees were everywhere at Harris Farms. If they were still long enough, I could see the bright yellow pollen clinging to their fuzzy back and legs—the critical ingredient to growing almonds. The Xerces Society, Häagen-Dazs and Harris Farms all believe that hedgerows—linear planting of native, flowering trees and shrubs on the perimeter of orchards—are one solution to support native bee populations on the farm, reducing dependence on commercial beekeepers. The main benefit of hedgerows is that they provide food for bees besides the almond crop. As part of its commitment to protect pollinators, Häagen-Dazs funded the installation of the largest privately owned hedgerow in California—a six-and-a-half mile habitat on Harris Farms that features 11,000 native drought-tolerant shrubs and flowering plants. "Without these reservoirs of native flowering plants, there’s no habitat on these farms to sustain the wild bees that are present here," Lee-Mader explained. "Right now, these farms are entirely dependent on the non-native honeybee being imported every year to this crop. If we were to see ongoing scarcity in honeybee numbers, there are no wild bees present to help contribute to the pollination process. These hedgerows solve that problem." This all matters because honeybees are dying at a disturbing rate. In a survey, beekeepers said that from April 2015 to April 2016, they lost a whopping 44 percent of their honeybee colonies. This is unusual. For comparison, Gene Brandi, president of the American Beekeeping Federation who happened to be at Harris Farms the same day I was, told me that when he started beekeeping in the 1970s, losing even 5 percent of your colony was not typical. Research to better understand the honeybee plight is still being conducted. 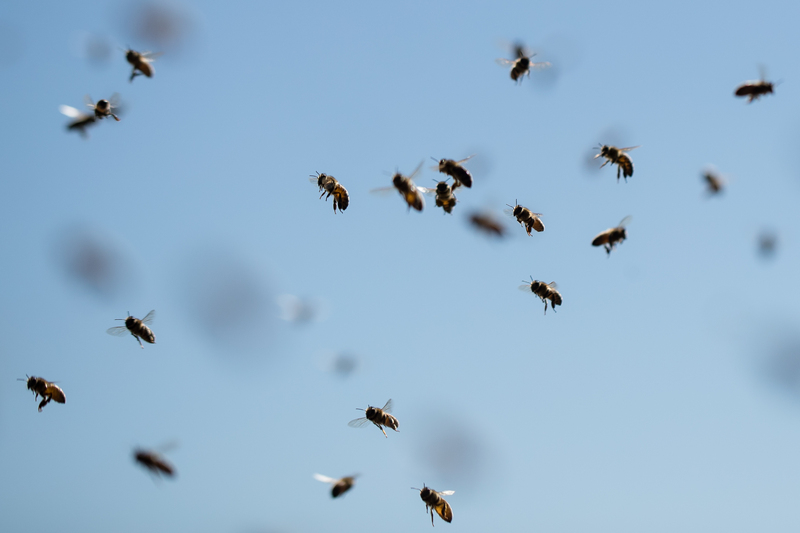 But there are three recognized reasons that contribute to reduced bee populations: loss of habitat, disease such as that caused by the varroa mite and spraying of chemical pesticides. Studies show that hedgerow construction may mitigate all three of these factors. More habitat provides a varied diet for bees, which improves their immunity, making them less susceptible to disease. Plus, predatory bugs attracted by the hedgerows eat pests on the farm, theoretically reducing the need to douse crops in synthetic pesticides. Hedgerows are a smart option to assuage the impact of conventional agriculture that prioritizes a high-yield, monocrop model. And I’m impressed by Häagen-Dazs’ commitment to not just raise awareness of pollinator importance, but also to finance a project proven to have tangible positive ecological impacts. But while wandering through the rows of Chowchilla’s almond orchards, I couldn’t help but wonder if hedgerows are just a Band-Aid for our modern farming system. I doubt biodynamic farms, which laud plant biodiversity, have issues with low native bee populations, as there would be enough food throughout the year. And bees are likely healthier when they return from pollinating an organic almond orchard that doesn’t use chemical pesticides than a conventional one—a theory confirmed by Brandi, who said his bee colonies seem more energetic and lively after pollinating organic crops. I posed this concern to Lee-Mader, who agreed. He explained that hedgerows fall into a category of conservation features on a farm referred to as buffers, which mitigate the environmental damage of modern conventional agriculture. Another example of a buffer could be planting grasses next to waterways to reduce fertilizer runoff. Farm systems with robust buffer networks like hedgerows are important. But are they changing the systemic problem of conventional, large-scale agriculture? I don't think so, as it seemed odd to plant hedgerows to encourage plant and insect biodiversity one day, and then spray trees with pesticides the next. "We really need to address pesticide use. We need to try to find ways to integrate more habitat into the crop itself. In an almond orchard, this can consist of flowering understory plants that can provide pollen and nectar throughout the growing season," Lee-Mader explained. "We need an all-available options approach to fix our food system, to fix agriculture. I think what we’ll see in the years ahead is this emergence of a conservation or regenerative agriculture model, where not only is this the right thing to do, but also there is a clear business case to do it. The farms that don’t do this are going to suffer down the road." Hedgerows can help protect pollinators right now. But we must continue to strive for holistic, long-term solutions that are directly baked into the way we manage agriculture for a truly bountiful future.